A credible mono synth that's great sounding and easy to use, but faces competition from similar boxes. Pure analogue sound. Retro styling. Mysterious expansion port. Reliance on MIDI control. Poor octave scaling. Err… that mysterious expansion port! The retro looks and analogue sound of Vermona's latest will appeal to old synth fans. The potential uses of that mysterious expansion port are as yet unknown. This is one of two new tabletop synth boxes out this month from analogue purists Vermona. 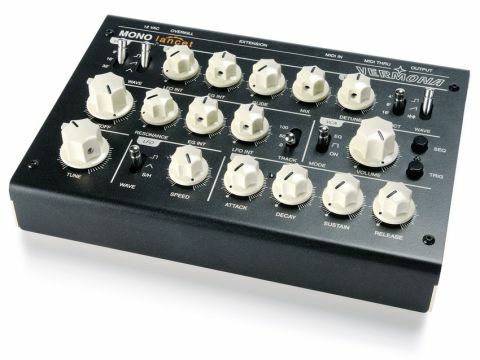 Mono Lancet is a two-oscillator mono synth with basic architecture, adding one filter, one ADSR envelope and one LFO to the equation. The unit sits on the desktop and is about the size of a typical paperback book. It has a bit of a retro look to it, with its cream star-shaped knobs and two-tone brown metal chassis. It tilts forward slightly, making the three rows of knobs easy to read and all the more tweakable. "You can count on a nice creamy tone, buzzing acid lines, squeaks and gurgling sound effects." When we first spotted the Overkill switch, we were eagerly anticipating some kind of nice overdrive stage or peak limiter to further warm the signal. Alas, reading the manual reveals that it's nothing so exciting; in fact, it's actually just the equivalent of a power on/off or standby switch, though Vermona are keen to point out in the manual that it is 'no power switch'. Something must have got lost in translation, but always remember to unplug synths when they're not in use. The top row of controls is used for VCO 1 and 2 and its various modulation options. Each oscillator has a three-position switch to choose from Pulse and Saw waves, plus one extra option - either a triangle for Osc 1 or noise for Osc 2. Both have three-position octave switches with Osc 2 sitting one octave higher. It also offers independent de-tuning by up to seven semi-tones in either direction. The pitch of both oscillators is modulated together, and sources include the LFO and the envelope - which provides positive and negative modulation. The Glide knob adjusts the speed, and when the knob's at zero, glide is off. There is a second Glide Legato mode available (this only slides the overlapped notes) and this can be switched on or off via MIDI CC 89. This is achieved by sending the designated MIDI CC number below 64 for off and above 64 for on. In fact, Vermona have previously used this method of transmitting MIDI CC messages to switch various functions on and off when there is no switch on the front panel. Mono Lancet's mix control blends the two oscillators - it's worth pointing out that the volume stays even around the centre position then gently slopes off in each direction, leaving one or the other at max loudness. Since the oscillators are always being fed into the filter at a constant volume, there's no way to overdrive the filter on the way in. Another limitation from not having a dedicated oscillator volume control is that, even when the filter resonance is set to self-oscillate, you can always hear the background tone. The next row of knobs is for the VCF and the VCA. The three-position switch selects between the EG, a gate or always on. You can also use the Trig button or the mysterious SEQ button. Not a lot is explained in the manual about how to use what you would imagine is a sequencer - other than that, if you press it, it plays a seemingly random repeated sequence. So apparently, this isn't so much a programmable feature as a little utility to check for sound when there's no keyboard handy. The final bits of the puzzle, namely the LFO with S&H and ADSR, are located at the bottom, along with master tuning. The LFO features Square, Triangle and S&H shapes, and speeds range from the super-low 0.05Hz up to 250Hz for some cool buzzing, FM-style tones. Tuning stability is one of the banes of analogue synth use. As far as consistency goes, the Lancet wasn't too bad; it remained fairly stable and didn't fluctuate out of tune too much from ambient temperature. On the other hand, the octave scaling on the test unit was a bit out as we jumped from octave to octave. This is true of the three-position switch, which gets flatter by 12 cents per octave and also when played using a keyboard. Maybe that's what some analogue enthusiasts love but we'd prefer it to be more accurate and that this was checked and calibrated at the factory. Some users will no doubt moan about the lack of switches for engaging the options - which would obviously be the most convenient solution. But to look on the bright side, space and cost aside, you can store a number of different setups as MIDI files, and in this way everything can also be automated via a sequencer. Bleep-wise, this synth is as capable as any other tabletop analogue box, of which there are plenty. Don't expect anything particularly new, but you can count on a nice creamy tone, buzzing acid lines, squeaks and plenty of gurgling sound effects. With a limited amount of knobs on the box to play with, it's not always obvious how this will affect its potential for sound design. The Mono Lancet has a number of extra features that are only accessible via MIDI. This includes several option modes such as legato glides and velocity to amp or velocity and after-touch to filter cut-off. You might notice that there are no controls for PWM directly on the machine which, in our opinion, is certainly a serious omission, but you can actually adjust the pulse width via MIDI. You can turn this feature on and off using MIDI CC 85, then spinning or programming the Mod Wheel gets you modulating. This is the only assignment available for the Mod Wheel, so you might as well leave it on - it's too useful to just be overlooked. We are divided in opinion as to whether or not it's a good thing that some of these options are MIDI-only, as we like the ability to in filter curve automation, but we're sure that analogue purists (and this is definitely the market in which Vermona excel) will not be so happy that they need to plug in a computer just to change the glide mode or PWM. The lack of information regarding the 25-pin D-Sub expansion port makes it difficult to ascertain how much it will add to the synth's feature-set and ultimate value for money, and if it will integrate nicely with a modular setup. Vermona have hinted that this will add CV/Gate style modular inputs and outputs for controlling things such as PWM and the filter, a MIDI-to-CV converter and also audio inputs, but they haven't announced whether they will sell a pre-configured cable or if you will have to make your own. This may change in the upcoming months, when Vermona unveil their master plan for the Mono Lancet, but until then it kind of sits in the ether in terms of value. If these features do come to pass, then its value suddenly shoots up. For the moment, though, it doesn't do enough to stand out in the crowded desktop synth market.